The Arthur R. Setz history indicates that this church was first built in November 28, 1892 at a cost of $5,500. Our history window goes back to 1854 when S.W.Martin was the pastor and B. Phelps was the district superintendent. According to our history window, J. Wills was the pastor and T. Walker was the district superintendent when this building was built. We can’t determine if the windows in the sanctuary are original equipment or not but there seems to be some consensus they are. The original church ended somewhere around the communion rail and in 1915 the alter section was added at a cost of $2,800. In 1942 the church was extensively remodeled and considerable thought and money went into the placement of windows and the liturgical significance of them. The rose window above the alter was given in memory of Algenia L. and Garrett J. Porter . This window has a lot of liturgical significance. The window is round which is the symbol of eternity. It has five petals representing the five graces of the Holy Spirit. In each petal are 3 roses representing the Trinity and within each petal is a cross with the marks of the crucifixion. The windows on the side of the communion rail are well placed in that they represent the elements of communion. Grapes for wine and wheat for bread. 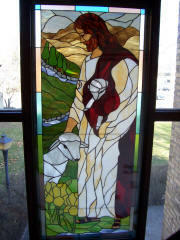 The window with the grapes was given in memory of Mother, Mabel, Grandfather, and Grandmother White by the L.C. White family. The window with the grain was given memory of Sophia Phelps Mackenzie and Edwin F. Mackenzie by Viola Mackenzie, who was a teacher at the Waterloo Grade School. The baptism window was given in memory of mother Hattie Cole by Harold and Lawrence Cole. The West window, given in memory of father Alexander and mother Suzanna McCracken, Mary, Robert and Cynthia by William and Emmit McCracken and the East window, given in memory of John Fox by his wife Josephine were evidently planned to be together. There are so many Bible stories connected with them individually and together that there could be no happenstance to how they were coordinated. One of the petals in the West window has a cross and crown which indicates that Christ is King over the cross and the panel on the East window with a butterfly represents regeneration and a new life. Putting these two together, we can visualize that just as the caterpillar survives the cocoon and is transformed into a beautiful butterfly, so Christ also overcame death on the cross and reigns over all. On the west Window, Christ the anchor of our hope and the nails on the cross in the middle panel of the East window, demonstrate that although Christ was nailed to the cross, he overcame death and provides the anchor of peace and tranquility for our living today. On the West window, the Bible tells the story of the birth of Christ which is represented in the East window by the crib and bundle of grain. In the northwest corner of the sanctuary is the olive wreath or branch window which was given in memory of Louise Deppe Fentzlaff by her children. This window denotes peace. We can find no mention of who gave the history window. It is unique because it lists all the pastors and district superintendents that have been in the church since 1892. In the rear of the church, which used to be the league room, we have the Easter window on the West wall which is what it looks like. It was given in memory of Harriet Hoag Sheridan but no mention of who gave it. The Jesus window facing the street was given in memory of Caroline Hoag but no mention of who gave it. The two windows in the hallway were given by Maude Zimbric. The Jesus window in memory of her husband J.D. and she gave the praying hands window.